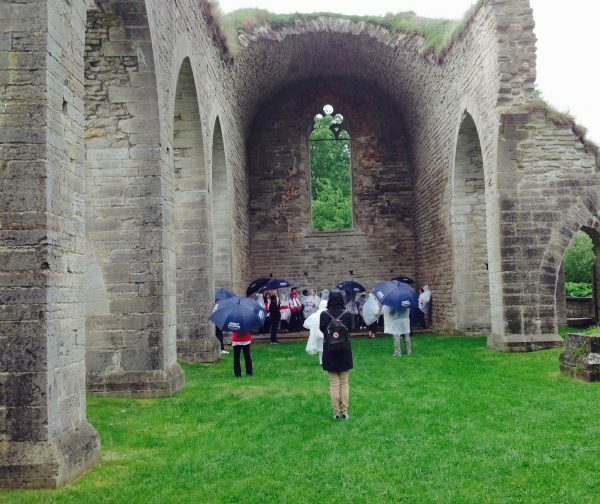 The rain came when we visited the ruins of Cistercian Alvastra Abbey in Östergötland. With high winds and strong rain, we aborted the walk as part of following the footsteps of St. Bridget of Sweden. Instead, we spent more time in this ruin given to her by the ruling king to establish a religious order for women even though she was not a nun. I would have wanted to do the walk and meditate about her pilgrimage to Santiago de Compostela, about her life as a married woman with eight children, about being summoned by the king as a lady-in-waiting, about her travels to Jerusalem, about her successful failures, visions, and dreams. Here in the abbey where her visions started and became the Bride of Christ. This entry was posted in 2017 - Scandinavia and Baltic and tagged Alvastra Abbey, Birgittine Order, Cloister Nuns, Faith, Feast Day, July 23, Pilgrimage, Religion and Spirituality, Saint Birgitta, Saint Bridget, Sunday Snippet, Sweden by Perpetua. Bookmark the permalink. When I was a child in parochial school I read the books in the library there. All were lives of the saints. I don’t remember reading about her but I bet it’s a good story. Most of the saints led very interesting lives, dedicated to their faith. She is not mentioned in the book of All Saints given to me by Jesuit either. I found out about her from the lady that organized the Scandinavian pilgrimage. We all lead interesting lives just reading your blog. Your anniversary falls on her feast day. Blessings. Correction, we are still In the month of June. Losing time as I age. There is an order of Saint Birgitta sisters in Darien, Ct. We often attended faculty retreats in their beautiful residence. They were always most hospitable. Very recognizable by the cross at the top of their habits. Wonderful. I’ve haven’t met her order and nothing here in Canada only in USA. I’ve seen what they wear displayed at the convent. I must say the head gear is interesting, very Viking. If not sacrilegious: I always likened the marking on the habits as those worn by the head jammers in roller derby.